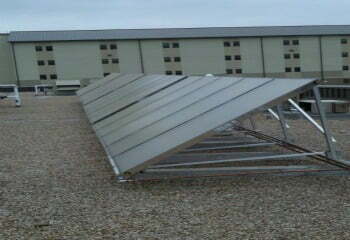 Binghamton, NY USA (December 22, 2011) – SunMaxx Solar, a leading, vertically integrated manufacturer of solar thermal systems and components, is pleased to announce the installation of a solar thermal system at Fort Hood in Killeen, Texas. The project was conducted in conjunction with Johnson Controls and Intelligent Green Solutions. A total of 93 TitanPowerPlus SU2 series flat plate collectors were installed across five buildings, in addition to solar pumping stations and storage tanks. Each building was also outfitted with a custom ballasted drain‐back mounting system designed specifically for the US Military. This solar thermal system was installed for a domestic hot water heating system, which will pre‐heat water for five of Fort Hood’s dining facilities as well as a large pool collector installation. The system was completely installed and commissioned during the Summer of 2011. Fort Hood is the world’s largest military base and covers a total of 340 square miles in central Texas. The system was installed as part of an energy conservation program to help reduce Fort Hood’s carbon foot print. This was also a pilot study to see the effectiveness of using solar thermal on their base. “It’s rewarding to see that we are starting to take measures towards implementing a renewable energy strategy at US Military bases!” said Adam Farrell, SunMaxx Solar’s President and CEO. SunMaxx Solar aims to build a sustainable future for our global community. In today’s energy consuming world, SunMaxx offers world‐class solar energy and renewable products, striving to meet the increasing need for alternative energy sources.